She still lives in deeds, not years. Two leading Hastings suffragettes were Mary Hogg and Mary Tristram, who lived together, in lodgings, first at 4 Highland Mansions then at 36 Eversfield Place. 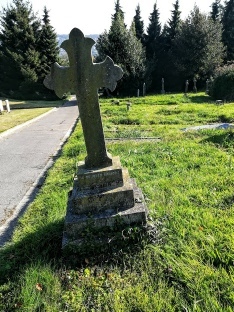 In the hour of the triumph of the Women's Suffrage Movement, Hastings has lost of of its keenest and most enthusiastic supporters through the death of Miss Mary Louisa Hogg, daughter of Mr Charles Hogg, of the Indian Civil Service. It now some years since I and many others used to work with Miss Hogg and Miss Tristram in the great Women's Movement, but I could never forget till the very end and not really then, how magnificent was the strength of endurance, the splendid light of enthusiasm, that used to keep Miss Hogg on her way through the hardest of difficulties. She simply could not be conquered, she set her mind to any task when it had its moments of supreme difficulty. I remember a time honoured procession in St. Leonards of the W.S.P.U. I was just behind her, and so I saw how she kept up through the strain, the indignities, the opposition, till her physical powers could keep up no longer. I remember how she would stand selling the women's paper at weather-beaten corners, through rain and wind, and objectionable remarks, all through the hours. She stood there pushing the cause into the minds of the crowd sheer force will and hearty cheerfulness……..